In this posting about “Safety First” we are once again talking about a topic that has a lot of emotional charge to it. There have been many times in my life that I have picked up the phone, or gone on line and read on Facebook that a monkey has gotten away. So let’s get started with some important information that could be very helpful for you or someone who you know that has a monkey that has gotten away. I would like to think that because of my experience with this issue that this is one reason I have always been successful with getting a monkey back when it has gotten away. However, I know that it is not always the case with many people that I know. There have been stories of monkeys getting out and being run over by cars on city streets and then others have been killed by dogs. There have been stories of people who have chased after monkeys for several days with them scampering away just as they were about to be caught. 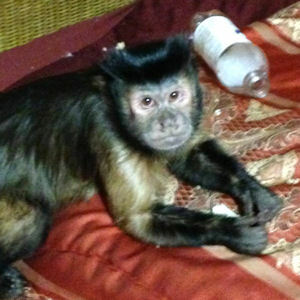 I even know a story of someone that got a call about their monkey being found and returned after 6 months. Many of the above stories were in subdivisions, country settings, apartments and even some have been in the tropical forest and heavy vegetation around Florida. Monkey escapes can happen in all different types of living areas or types of accommodations that we are keeping our monkeys in. I think that it might be the best thing to start this “Safety First” subject by asking yourself some very important questions. These questions will be your way of rating yourself in the way you are keeping your monkey safely in your home. You may even see after you read this list that you are doing rather well at your existing way of keeping your monkey safe. However, you may wish to make some changes after you read the list. I am such a believer in listening and learning from other monkey caregivers. There is just no way to know everything thing about monkeys because they are so very different, just like children are. Each monkey is this individual little being with such different emotional make-ups, personalities and intelligence. Many monkeys are so very intelligent that this becomes a very big part of the problem of keeping them safe. Some of us monkey caregivers live with some very intelligent monkeys that love to outsmart us at every opportunity and seem to mimic everything we do. So now to the list of questions. Do you have keyed locks on your cages with extra keys? Do you look often at the wires and fittings of your cage? Do you look often at the toys, blankets, and other types of things that are in your cages for safety purposes? Do you have chain locks or other special types of locks on your outside doors so that you can lock them during times that your monkey is running loose in your home. Do you require everyone in your home to use a lead harness or belly belt when they get your monkey out to have time with them? Do you intentionally teach your monkey how to lock and unlock doors? Do you spend time teaching your monkey about going into a plastic travel cage? Do you feed or give special treats in your monkeys travel cage so that they will understand and know that the travel cage is a place to get food? Do you plan to change your monkey’s cage and tethering equipment as your monkey ages and grows not only permanent teeth but also grows in size and strength? Do you and your family have a plan about what you would do if your precious monkey were to get away? Thanks for taking some time to think about these questions. Many escapes can be easily avoided by making good rules. It can be a very positive thing, when one person makes the rules and sees that everyone follows them in your family. It is never too late to make rules that everyone must follow. Please consider doing the cage training with your monkey. Many monkeys will come running when they see that you have their favorite blanket, and food in their familiar place. This can be done very easily and at any time in their lives. When you use food (and their favorite blanket) to do this with, then it will be much easier to create a safe space that is not dreaded. The way you present it to them and swing them into the cage (with your whole body) sends the message that this is where they are going. They see you are not angry but you are using your body language to show them this is what they need to do and they get a treat too! You are happy and they are too and then you have an important tool that is used when they might escape. Teaching your monkey to accept being in a plastic cage could also be very important in case of emergencies like weather turning bad or in case a fire were to break out. The plastic cage is a very important tool in my monkey care giving. I write about these types of things in my book called “Living With Monkey.” Our monkeys do not live in the wild. They are captive primates and are living their life in the same world that we are living in. So to keep them safe as we are transporting them, we must use the tools we have available. Teaching our monkeys how to be comfortable in a plastic cage is imperative. Three years ago I had an opportunity to meet the monkey caregivers of Silly Willy’s half brother. Tike and Silly Willy are 4 days apart in age and have the same father. I will be telling more of this story in part two of “Help – I Have Lost My Monkey” posting, but I wanted to share about Tike’s experience with the plastic cage first. 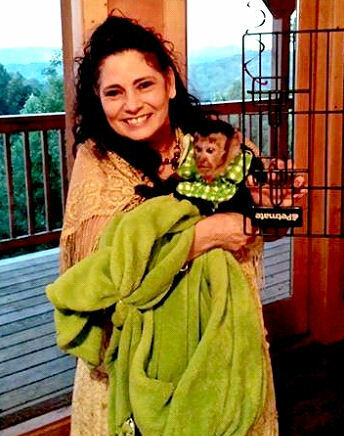 To me, this is an amazing story that will help you too become brave when you decide to teach your monkey about using a plastic travel cage. 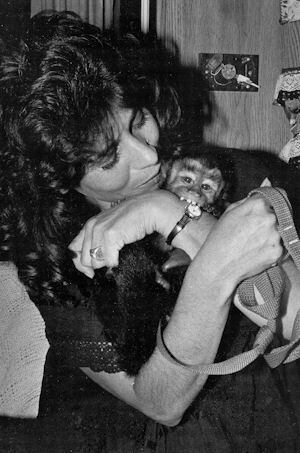 When I met Danny and Lisa Covington, their monkey Tike was 5 years old. I learned very quickly from talking with them that Tike knew how to do almost everything that they could do. He knew how to open doors, locks, medicine bottles, tops from coke bottles, refrigerators, windows, blinds, and many more things. He was smart and just began picking up on how to do things. 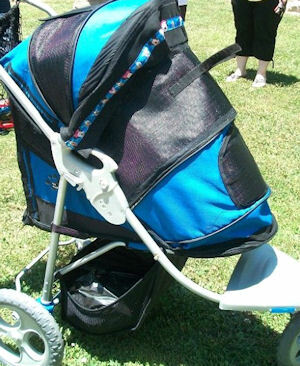 The only type of caging they used as Tike was growing up was a heavy duty pet travel stroller. They took him often into the businesses that accepted his service animal papers. While he was in the stroller, he was constantly crying and trying to get out of it. It looked very different from the way it looks in the photo below because he loved to chew on it and be very destructive to it with his adult K-9’s. After Lisa and I worked 6 weeks on rebuilding Tike’s stroller to accommodate his chewing, it was time to try him again in the refurbished stroller. He went in it very easily but when the zipper was closed he started to cry and then tried to get out of it as he had done many times before. The changes that we had made did not help at all with the problem of taking him safely in the stroller. We knew that the only way Tike would be able to continue to go places with them would be to train him to use a plastic cage. By taking the cage that we wanted to use for Tike around with us, we were able to find a child’s carriage that would accommodate the cage. That part of the problem turned out to be really easy. So we then started thinking about how we were going to get Tike to go into the cage. Believe it or not, it was a very easy thing to get him used to the plastic cage. Of course, they put a treat in the cage for him as he was going into it, which gave him the incentive to go right into it. We were so shocked when we saw how much he loved the cage. Soon they started taking Tike everywhere again with them and found that he was much safer and happier with the cage and the child’s type stroller than he had ever been in the extra heavy duty pet stroller they had used for the first 5 years of his life. He no longer cried or caused attention to be drawn to him. A cover was placed over the hood of the carriage and the door of the cage was facing Lisa as she strolled him around. From the beginning Tike loved the smallness of the cage and he would curl up every time he was taken out. Now he loves to go into his exercise cage at home and continues to go happily into his plastic travel cage. We were all shocked to see how he chose to love and accept it so quickly. Now let’s begin with the information that will help you be successful in re-capturing your monkey safely. Get busy instantly on getting your monkey back home. Put your mind into a positive direction by beginning to network. Get weather-proof signs together to put out on telephone poles and in other places. These signs should be large enough so they can be seen from the road. The amount of the reward should be set no more than $500. The reason for doing this is that people will run you from one place to another when there is a huge amount of money offered. (You do not need to waist your time during this process). If you feel raising the amount of reward is important, you can choose to do this at a later time. You will need to decide if you feel if you need to call the local authorities about this issue. It is entirely up to you to make this decision. Talk to everyone you run across (that is willing and available to talk with you) about your monkey. Make sure you have many handouts available for everyone that you meet and speak with. The handouts do not need to be huge but they do need to have a photo of the monkey and the important contact telephone number on them. The small handouts and signs can be 1/4 of a page so you can get four to a page. The pole weatherproofed ones need to be larger. Try to get the best possible print on all of your signs, and handouts. You will need good size heads on your nails for the poles, hammers, large push tacks or push pins, strong clear tape for windows in stores, and tape where you cannot hammer your outdoor lamented pole signs (maybe duct tape.) Remember to call in favors from your friends and relatives during this period of time to help. The words “Monkey Lost” “Reward” needs to be very large for the page size flayers so that they can be tacked up everywhere you go in your area. The (8 1/2 by 11) size flayers go inside of the windows of grocery stores and other places where people visit often..
Getting the message out to people in your area is so very important when a you’ve lost a monkey. Responding quickly is very important and absolutely necessary in order to make your chances of getting your monkey back a reality for you and your family. Of course, we all know that this is old style networking that we are choosing to use to get the message out, but (believe it or not) it still works great. Facebook and other new types of networking are important also but getting the word out fast in your area is very important in to getting a lost monkey returned to its family. If you have been reading the last three postings you will recognize this list as being similar to the list used for a stolen monkey. It is very important to get the networking started quickly so people who will be seeing the monkey will know how to call you. Now, let’s start the next part of the procedures for getting your monkey home again. When a monkey gets away, you usually have a general idea of which direction they were traveling in. I am hoping and praying that all you need to do is grab its favorite food, blanket, cage,walk out the door, call them ,and they will come right to you. Many hand raised monkeys will not go up into the trees when they get loose. They will mostly seem to stay on the ground. The monkeys that have spent lots of time out in outdoor exercise cages could be the ones that might travel through the trees and be harder to get back home. They have been acclimated to the outside noises, smells, and other things while being outside. Because of the life expectancy of monkeys, there are still some wild caught monkeys alive in our country. If one of these types of monkeys escapes it could be much harder to get them home again because of their remembrances of being in the wild. These types of monkeys will definitely travel longer distances because they can cover much more area when they are using the trees. If you follow the monkey and it keeps on running away, then it is absolutely imperative that you start the networking immediately as listed above on the list. During the same time, someone in your group needs to go and get two maps of your area. This should be a local map. You need one so that you will be able to see the area that you will be looking and networking in and also to have it so that you can write on the map. Have the person that is getting the map to be aware of why you need this valuable tool. As you are delegating jobs to get the printed things ready, go to the computer and pull up Google Earth and take a look at the areas terrain that you will be search in. Take note especially if there is going to be wooded areas so that you can tell the people that will be searching to dress accordingly. This first look from above could be very scary to look at especially when you think how small your monkey is in comparison to the size of the area that you will be consecrating on searching. Assemble your helpers as quickly as you can. Tell them to bring fully charged cell phones. Gather up the necessary things such as flayers, handouts, laminated pole signs, hammers, nails, tape. Tell everyone to not only bring fully charged phones, but to also bring boots, extra shoes, food, and drinks if they will be on your search team. The kids that will be helping can use bikes as they are going house to house. With maps laid out in on a table or the hood of the automobile, circle the area that you wish to plaster with your printed materials. Section this off and assign people to each section. Remember to mark everything on both copies of the map of your area. Give them the supplies that they will need to get the networking started. Be positive that you will get the monkey back and that each one of their jobs is very important. Let them know you appreciate what they will be doing and that their job is one of the most important keys to getting the monkey back home. Before your crew is sent off to do their jobs make sure everyone has the phone number of the person that will be at home taking phone calls from, the people who will be seeing the monkey. as it is traveling around your area. At this time it would be good to coordinate phone numbers of people who are in certain areas working to get the printed things out. Having numbers so that you can text everyone with up-dates on the calls and what is happening during the search is very important. The number two “Key Person,” (the one that is away from home) needs to take the plastic cage with him or her and the PA system. If at all possible you should try to get two PA systems because both “Key People” may be needed during the last part of the search right before you get your hands on your monkey. Please remember to protect your voice with different things during this process. It may be that your voice is needed two days after you are searching to call out to your monkey with the PA system over and over again. Your monkey will need to recognize your voice. This is important! Things can change fast during this type of search. If a call comes in and someone has just talked to someone that saw the monkey then the key people will need to make fast decisions as to who goes to check out the sighting area and who remains doing the networking with the printed things. The two “Key People” must be equipped with what they need to move people in and out of areas as you begin to get sightings of the monkey from the people who have been contacted about the monkey escaping through your networking. Both “Key People” should have a list of the phone numbers and areas that each person in the crew is working. Moving people from place to place needs to be done quickly and efficiently and both “Key People” need to be in communication when people are moved and mark it on the maps. The “Key People’s” phone numbers need to be put into each person’s phone before they leave. Now that you are ready with the maps, hand outs, and all of the other things that we have talked about. Go to the computer and show everyone the area that everyone will be working with on Google Earth. It is very important to see what type of terrain you are going to be possibly search in. Now to the last things that needs to be done before the crew heads out. Make sure that everyone understands the details of such things as: what the monkey has on – tell them what they should do if they talk to someone that has seen the monkey – tell they what to do if they encounter the monkey – tell them if you wish for them to try and apprehend the monkey – tell them to contact the “Key Person” that is home if and when they leave the area so that you will know this and be able to put it on the map that they have left . The map that stays at home is your master map. The other map will not get the updates that the one at home will have. It is very important that both “Key People” be calm, in charge and together emotionally This time before you send the crews out to start the networking does not need to be filled with panic, crying, anger, blame or guilt. 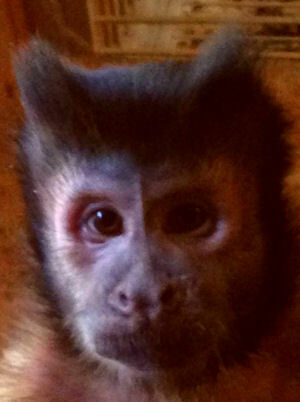 You must believe with your whole heart and soul that you are going to get your monkey back home. Use every moment to cover all details with your crews. The monkey will stop moving at night. When you cannot see, remember that the monkey cannot either. They will choose to get to their sleeping area before last light. They may choose to sleep where they find food or water before it gets dark. This is the time to send your search helpers to get some rest. The other networking people can continue on with their jobs until it gets to late to disturb people in their homes. They can begin to concentrate on getting the flayers and laminated pole signs up if at all possible now that it has gotten so late. Go home if you are the “Key Person” that has been out searching and talking to people. While you are at home, you will need to coordinate your two maps and make sure they are correct. You must get your outdoor sleeping things together and put them into your car. You should also locate a PA system – it can even be a child’s type system so that you can use this to call for the monkey instead of wasting away your voice. You need to locate a tall ladder if possible. You may need this if your monkey is in a tree and refuses to come down and into the plastic cage. You Need Your Voice During This Process Of Getting Your Monkey Home. Keep throat lozenges or hard candy in your pocket to coat your throat. Drinks can be used of course but remember bathrooms are not always available in your search areas. When you have all of your things together and have gone over your plans for the next day, then get some rest. Pray, clear your mind, talk to your monkey in your mind, visualize getting your little one back. Turn loose of all of this and get some much needed rest. I assure you your monkey is living in the now moments. Whether they are sleeping, or staying awake depends on how safe that he or she feels in their final place that they have chosen to stay in before nightfall. Your monkey will not move until first daybreak. Get some rest. Please do this because it could be one of the few times during your search that you will be able to rest! Set your alarm for an hour before first light so you can get up. The networking of the first day will start helping you as people start seeing the monkey in it’s early mourning search for food and water. Make sure you have everything that you will need to stay out all night loaded in your car. Flashlights, PA system, food, water, things for warmth, or coolness depending what your weather is like. Make sure your phone is charged and you have a way to recharge it. Make sure you have plenty of gas. If you have had a sighting late in the day that will be a good area for you to consider searching in first. The people that will still be able to help you search and network need to be given directions to start the day off with. Therefore, it is important that you and the other “Key Person,” have made a plan the night before. It is time to get day two into play. Texting everyone that you had numbers for who helped with the networking the day before need to be up-dated. You could ask people to contact you if and when they might be able to help you again in this text also. Of course, up-date your Facebook friends. How to pick who the “Key People” will be in your plan to carry out your search for your monkey. The person with the most physical stamina should be the person to go with the networking crews. Both of the “Key People” are very important to making your plan work. The person that has the most personal relationship with your monkey needs to be the stay at home person. When the search is narrowed down to a certain area this person will need to be the one to go to that location and be prepared to have the stamina to do the re-capturing part of your plan. This person will need to have a rested voice because they will be needed to call and let your monkey know they are present. 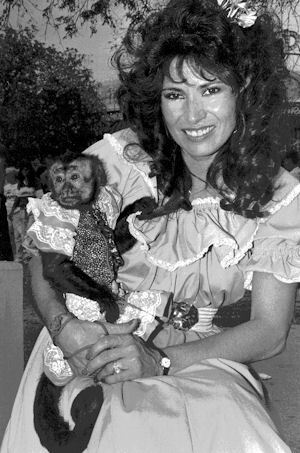 In the late part of the eighty’s I had learned of a monkey that needed a new home from an aging organ grinder from Georgia. The little monkey was living with a diabetic monkey and she was being frequently abused by him when his illness was not being controlled . 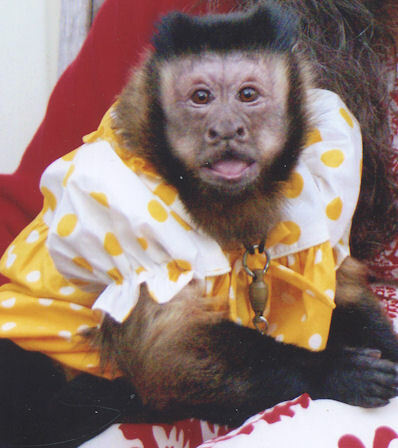 Becky was an older monkey, and she had been a pet monkey all her life. I picked her up on my way from Tennessee to Florida. The trip went really well, and she and I were riding together in the front of my truck the entire rest of the trip. I had no idea how important this bonding time we had during our first hours together, would turn out to be for both of us. 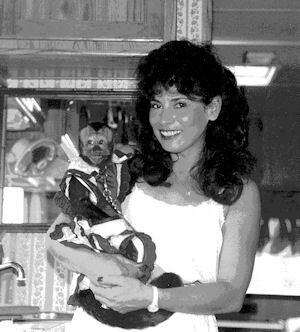 The next day after arriving home in Florida, I decided to move my 5 monkeys from the truck camper and into my monkey show trailer, which had large floor to ceiling show cages. The monkeys needed some much needed exercise and fresh air after the long drive from Tennessee. Becky was having fun with the baby monkey Pincher, so I decided to leave them together for some afternoon play and nap time. I remember thinking to myself, I don’t think that I will put the lock on the heavy lift up sliding door to their cage in case there begins to be a problem between her and Pincher. I wanted to be able to get to the baby fast if this were to happen. I then locked the door on the trailer and went around to the front of the trailer to watch everyone and see if they were comfortable and happy. As I was walking away from the trailer I stopped Michael (who was my T-shirt Events Business Partner) and told him that Becky and Pincher were together and to please remember if he does go in to visit with Becky and Pincher, to remember to lock the trailer door behind him. In the late afternoon it was time for me to move the monks back into their night cages in the trailer, so I told Michael that I was going to do this. I guess because he had not been able to visit with them, he decided to go and spend some time with all of the monks but especially the baby Pincher and Becky. My heart was in instant panic. I have a monkey loose. She is a new monkey. She is loose in alligator water area. She is loose in snakes, spiders, and every type of outside critter area. She does not know any of us, and it is time for it to be dark! Kermit had told me about monkeys getting loose and never getting them back. He had also told me that monkeys cannot see in the dark too. This was the worst thing happening to me as a new monkey person, and it was happening at the worst possible time! I was going to be dark soon. I did not have a plan. I did not like the wildness of Florida. I was an emotional wreck and so was Michael. We called and called to her from the yard area of our neighbor, Frank’s place. We would call and then listen to hear if she would call back but we heard nothing coming from the swampy freakish water area. The area was full of Florida vegetation such as banana trees, and lots of gnarly type of vines and low to the ground growth. When you looked into it you could not see more than five feet into it before it became just dense with growth. Michael continued to search and call to Becky as I left to move the monkeys from the show trailer cages back into their eating and sleeping cages that were in the travel trailer. I was torn between what to do. I felt that I needed to be looking for Becky but I also knew I needed to take care of the other monkeys especially the baby Pincher. So, I hurriedly fed, watered, took care of them, and then I also decided to get ready for nightfall. I remember talking the Becky in my mind. Telling her everything that I was doing and that I would be right back to get her. I repeatedly ask God to help us find her and to please look after Becky and keep her safe. I knew that I was going to need to get warm clothes on and that I was going to need things like flash lights (lots of them), and maybe even an oil lamp, too. I quickly got blankets, extra warm clothes on, gloves, hat and then I was out the door telling the monks I was going to leave their door open and Becky’s cage door open in case she wanted to come back to them. As I stepped out the camper door, the first thing that hit me was it was getting darker by the moment and I had a monkey lost in the Florida jungle. I knew there were alligators out there somewhere. I did not like to be outside at night walking around off the driveway and walkways. Becky was out there I had to be brave, and put all my fears of critters away. This was not a time to be afraid of anything! I told Michael just after I arrived to go ahead and get him something to eat and get some rest. When we looked at each other we both burst into tears. We both knew what we were up against due to listening to all of Kermit’s stories of monkeys that had escaped. Darkness comes so quickly when you do not wish for it to come. I remember becoming one with the area. It was the only way that I was going to survive this entire thing. I put my things on the ground and started calling to my little new Becky and then I heard it! There were three little wo-wo-woos answering me in return this time. I ran closer to the area where I had heard her and called to her again. I said to her, “I am here Becky, come to mama, come on little girl. The closer I walked towards the place where I had heard her I could hear her movement going away from me. She wo-wo-wooed to me one last time as the last light of day went away. I was alone now with the darkness as I looked into the jungle area that she had chosen to spend the night. I moved my pallet and I was ready to stay there all night. I knew she was there even if she did not call anymore to me and she knew I was there too. I did not leave her or the side of the jungle till dawn. During the night, I continued to talk to Becky but believe it or not, Michael awakened me with a cup of coffee at day break. I could not believe that I had actually been able to fall asleep or that I had actually called up 3 flying squirrels, a racoons and a opossum! Thinking back on this story as I am typing it makes me once again be so thankful that I did not call up a sneaky snake or a Florida gator while I was out in the neighbor’s back yard. As the sun was coming up we were so eager to walk over to the area that we last heard her call to us from. There was a banana tree at the beginning of the area that actually had bananas on it and then the low dense foliage started with vines and palmetto bushes. I called to her saying, “Becky, it is light enough for you to come out now. Come to mama, now. Come on, Becky.” Suddenly, she started calling back to me. I was never so happy to hear her little wo-wo-woows. I looked over at Michael and we both were smiling and full of hope. I am sure she must have picked up the change in my voice when I knew that she was moving in the opposite direction from us. The area that she was in was one of the most unusual areas. The brackish water was like a small river. All of the houses on Micheal’s street had this same type of yard area on the water. Their was land but the land had been cleared by the core of engineers in earlier years and the water was just under the cut trees. So, when you lost the land you were actually walking on tree growth that was growing from the swampy area. I asked him quickly as he came back onto the mowed peninsula area, “Why don’t you go and get some food Michael and I will see if I can get her to come over this way to me while you are gone. Before I knew it he came running with a banana from that banana tree. I had forgotten that the tree had food on it for her but Michael had not. I knew next what I was going to need to do. I blurted out the next words, “Thanks, Michael that is great. I am going to have to go over and get her.” I quickly took the banana and the little army blanket that she had come with from her previous owner and looked over at Michael. In my mind, I was praying and talking to both God and Becky. I prayed to God to help me do this and I kept asking him to tell Becky to please not move closer to the water. “I said out-loud, “I am coming, Becky.” I did not wish for her to make it to the water and make the choice to swim in that dangerous water. I could not believe how easy it was to walk that 18 feet and reach down with my hands and sweep her up into my hands and arms. She was wo-wo-wooing over and over again, as she was eating big chunks of her fresh banana. I was so happy! I had my new monkey back safely in my arms! When I arrived a few feet from the peninsula Michael reached for my arm and shoulder to help me make the final steps back up onto the land and then we both cried and hugged her. Becky the escaped little monkey was safe once again. Little did I know that here and now I would be telling this story to help many others gain good information about loosing a monkey. As I have been writing this story I was taken back to that space and time in my mind.. I still don’t know how in the world I did what I did. I am a “Big Chicken” when it comes to jungles, nighttime critters, and not being able to know what my feet are stepping on or in! Of course, I only wore flip-flops then as I like to do now. When you have a monkey loose you will do anything that you can to get them back safe and sound to your loving arms! This experience bonded us especially close. So, it was one of the hardest things that I ever had to deal with when (three years later) she died unexpectedly. The sharing of this story has once again been a gift from Becky’s time with me and her time with Michael too. He loved her so very much. They would spend hours and hours together just hanging out on his porch swing looking out at the water. He was so grateful for the opportunity to spend time with her and to know that she had been returned safely after his mistake. Now, let’s go back to the information that I am giving to you about getting your monkey home safely. During your search time and the calls coming in from people that have seen the monkey, the “Key People,” will get an area that you feel the monkey is in. This will not only be supported by people that are seeing and calling you about your monkey, but there will be a gut instinct that is telling you this is also true. This will be the area that you will choose to spend the night in. Monkeys will stop moving at dark and not start moving till first light of dawn. This is why you need to stay close so they can hear your voice and know you are there before they start to move in the morning. Have food, blanket, travel crate, PA system to save your voice, and remember to stay positive and if you pray, remember to do that too. If you are not the person that is closest to the monkey then you need to have that “Key Person” there before first light comes. The next steps taken are between God, you and your monkey. My words will be running through your mind and that is okay. Good Luck. Please remember to go and pick-up all signs that are posted on poles and store windows after your monkey is safely home and text your helpers about the good news. If you need to pay a reward please make sure this is also paid immediately. Please consider becoming a “Safety First” Monkey Caregiver! Thank you for visiting us here at Primate Care. We are committed to bringing good information for you to think about and share with your family, friends, and other monkey caregivers. We will be continuing to tell stories and to talk more about “Help – I Have Lost My Monkey” in part two of this posting. There are many more things to learn about in this “Safety First” subject. Please remember to continue to visit us here often, so you will be prepared if this happens to you or someone that you know.